The brilliant Douvan put in a superb display to justify 2/9 favouritism when winning easily by 11 lengths under Ruby Walsh. The six-year-old was completing a rare Cheltenham/Aintree/Punchestown three-timer and trainer Willie Mullins is already looking forward to next season. “We’ve seen a few not able to do the three Festivals this week so that was great,” said Mullins. “He got close at one or two but he jumped fantastically and did it like a fresh horse. You wouldn’t have known he’d been to Cheltenham and Aintree, It was as good a performance as we could have possibly hoped after that heavy schedule. Walsh added: “Gail (Carlisle) does a great job with him. She rides him out every day, looks after him, minds him and knows exactly how much work to do. She has had him spot on every time. There was a fair headwind and he was idling in front, so I was waiting for the others behind me just to keep him competitive. Willie doesn’t talk things up unnecessarily and he has always talked this horse up since very early on. Gail went up the gallop on him one morning and said this horse is better than Mikael D’Haguenet. 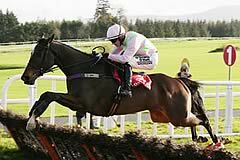 Rich Ricci commented: “Douvan is something else. I haven’t watched the whole race – I only saw the last two fences – but he seemed to be travelling well from what I was listening to and it was never in doubt. “I told Patrick Mullins that I was worried he was acting up a bit in the parade ring but he said just sit back and enjoy – he is in great nick. He proved he was and is so effortless – he doesn’t arch his back at his fences and gets away from them so quickly. He really is something else. “It will be interesting to see what happens next year. He has earned his summer off, that’s for sure. I wouldn’t mind stepping up in trip and seeing what he can do. Like all of ours, he will have plenty of options which I know will frustrate people but we will share our thinking as we go along. I think he is a horse you would probably want to try and step up in trip. He is obviously quick enough for two miles but is so big and effortless. He hasn’t stopped yet and doesn’t look like he is going to so maybe he could step up to two and a half and we will see how he gets on. He could be a King George horse, he could be anything. We will just have to see. “It is a fantastic training performance by Willie and he is some horse. Not many have won at Cheltenham, Aintree and Punchestown. They are all hard races, no matter how easy they look. It was a great performance by Willie, Gail and everyone in the yard. He is a pleasure to own, he is such a lovely, lovely horse. “I was worried when he played up in the parade ring. Jackie Mullins couldn’t watch and went back to the car! I was worried – he is on his toes sometimes but I have never seen him like that. When Ruby got on his back, he calmed down which gave me some relief. I don’t know what it was about but anyway he was brilliant.